After several months of planning from Toronto, Operation Groundswell Guatemala trip leaders Ben Sampson and Jay Wall headed to Guatemala in mid-June for two weeks of in-country preparations affectionately known as pre-con. They visited communities across Guatemala to finalize logistics of transport, accommodations, activities, and volunteer placements for this summer’s OG Guatemala program. It should be understood that Operation Groundswell trip leaders are generally restless adventurers who like to pack as much awesomeness into life as possible. Ben and Jay are no exception to this rule. Completing pre-con at a brisk pace left them just enough time to squeeze in a little extra fun before the arrival of their OG team. 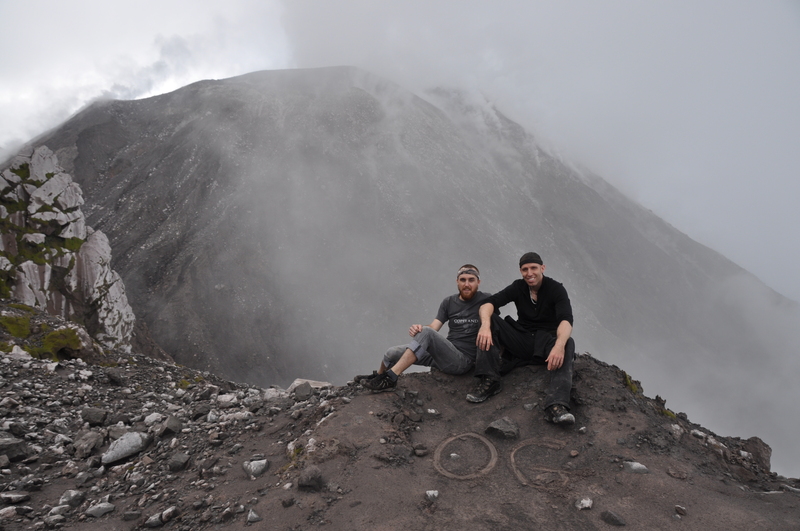 So Ben and Jay decided to tackle a two-day trek to Santiaguito, Central America’s most active volcano, along with their new friend Anna and their local guide Felix. The 18 km “path” to Santiaguito begins with a long climb, followed by bushwacking through the brambles, descending a slippery watershed, criss-crossing a rocky floodplain, and finally scrambling up mossy volcanic boulders to the mirador. In good weather, this is no walk in the park; with rain, it’s even harder. Reaching the sub-summit campsite at dusk and in torrential rain, the trekkers were forced to take refuge in a steady stream of water known as the Rio Tenta. After a cozy night of get to know your neighbour they all emerged to complete the climb to view the Santiaguito’s crater and witness Central America’s most active volcano huff and puff, gurgle and spit. Ben says “Santiaguito chewed us up and spit us out” while Jay cites this as this most physically and mentally challenging endurance test of his life. And that’s what made the adventure such a valuable experience. Not a bad way to set the tone for an epic six weeks with the whole team.